Howard Blitman P.E., F.NSPE was honored with Rensselaer Polytechnic Institute’s Presidential Lifetime Achievement Award at RPI’s Inaugural Scholarship Gala this past fall. He received this award in recognition of his service, philanthropy and partnership with Rensselaer for over 65 years. 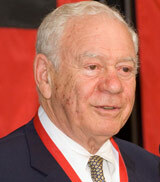 Blitman graduated Rensselaer in 1950 with a bachelor’s degree in civil engineering, and as an alumnus remained very active at Rensselaer as an adviser, trustee, philanthropist and volunteer. He established a professorship in engineering, and gave a gift to the endowment that allowed for the construction of Blitman Commons, once a hotel and now a student living space, which benefits both the school and downtown Troy community. In his professional life, Blitman is a consulting engineer and the president of The Blitman Building Corporation. He also served as president of the New York Chapter/NYSSPE in 1974-1975, president of NYSSPE in 1978-1979, and was elected president of NSPE in 2002-2003. Congratulations Howard, from all of your colleagues at NYSSPE!